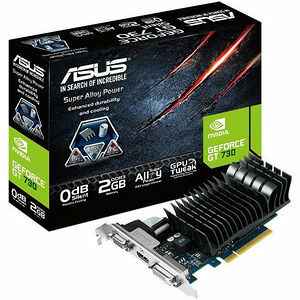 GT 730 is the astonishing high-value graphics card from ASUS! Equipped with the GeForce GT 730 graphics-processing unit (GPU), ASUS GT730-2GD3 includes some brilliant technologies that you can get only from ASUS. We've fitted dust-proof fan for 25%-longer lifespan, and equipped the card with our exclusive Super Alloy Power components for superior stability. GT730-2GD3 also comes with our easy-to-use tuning tool, GPU Tweak. Use this to squeeze every last drop of performance out of the card and then stream your pumped-up on-screen action over the internet in real time!